Can you believe that it's the last week of September already?! Time is flying by! 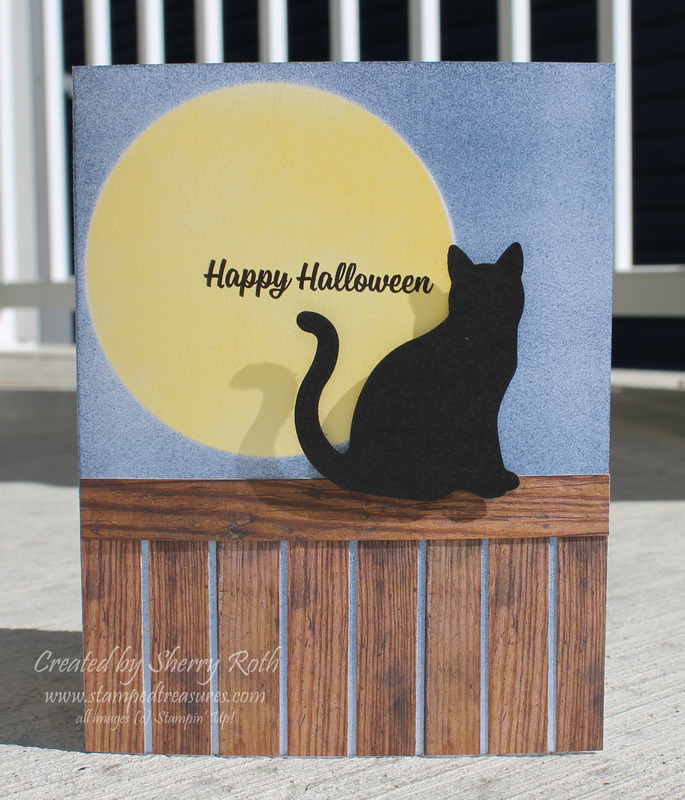 Today I have a cute Halloween card to share with you. But the great thing about this card is that it doesn't have to be Halloween. I can see this as a birthday, thank you or thinking of you card to a cat lover as well. What do you think? I started with a thick white card base. Using a bit of temporary adhesive I added a punched 2-1/4" circle to the top left and then brayed over top using our sponge brayer and night of navy ink. Once it was the shade I wanted, I removed the circle to reveal a bit white circle. I used the negative space piece from my punched circle (That's the piece of cardstock that is left behind after punching the circle). I placed this piece on my card base lining up the circle with the white circle and carefully sponged over top with daffodil delight ink. Next I used scrap pieces of the wood textures dsp to create the fence. The cat is punched from black cardstock and popped up using dimensionals. The Happy Halloween is from the Spooky Cat stamp set and is stamped using memento black ink. I've included a full list of supplies below. If you are in Canada and need any supplies you can shop online here.